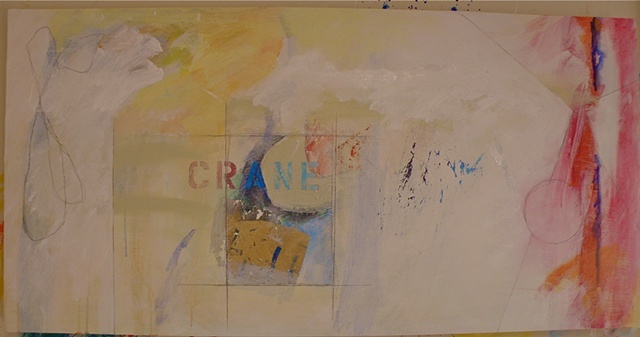 This is from the "Orange Slices" series, stencilled CRANE. All these works have a here/there quality... they are thinking about one thing (the beauty of a crane on the edge of a curve of the Bay) and also, yes, also, another: here, a world that is both lost and found, a recipe in my mother's handwriting for rhubarb pie. My father loved this pie. My mother cooked it, and they are both present and absent. They are both here, not forgotten, just like the crane that stands at the water's edge.